I really apologize to anybody who cares about my blatherings--I never did sit down and compile comments on #4. It was pretty much what we expected--closing the circle with the RGB characters getting to where they were in "Janine Melnitz, Ghostbuster" with a teaser or two to the upcoming annual and GBI/Vol.3. Considering the damage done to the Firehouse from the end of the Mass Hysteria! arc, the TMNT/GB arc and now in this issue... what is the heck is their insurance premiums like? Rather brilliant to utilize Proteus' pet peeve to weaken him in-story (and set up his demise), show future cases in the RGB, and seed the future of the IDW canon. Obviously one is the Sandman in the upcoming annual but the other three visions... it'll be fun to see how they figure. Also loved the irony of another god forcing Winston to make a hard choice in the Firehouse basement. At least this time, it doesn't involve him dying...shrug. Favorite line: "We met weird versions of ourselves with boring hair and then got zapped into limbo by some guy in a toga." As I thought, nice sync up to the end of "Janine Melnitz, Ghostbuster" and neat to see some more 'extra scenes' added in. Nice touch to show Claudia was okay. **The Winston Zeddemore of both universes are featured along with Slimer from The Real Ghostbusters. **The prime Winston has half of The Key from The Real Ghostbusters "The Brooklyn Triangle"
***The half of The Key is the one owned by the animated Winston until he gave it to The Collector. **Icon Ghost mentions the Interspatial Teleportation Unit. **In panel 1, the Icon Ghost hides his saw like he does in a bumper. **In panel 3, the Icon Ghost crouches down and hides like he does in a bumper. **In panel 4, still draped on one of the office chairs is the newspaper Janine reads in The Real Ghostbusters episode "The Grundel"
**In panel 4, on top of the office drawers once again is the Genie's lamp from The Real Ghostbusters episode "Janine's Genie"
**Continued from last issue, Janine is still wearing the outfit from the first movie when the Containment Unit was shut down. **In panel 3, to the left of Kylie appears to be Mr. Miyagi and Daniel from the original "Karate Kid" trilogy. **In panel 3, there is a Pequod's, the coffee chain introduced in Volume One of the ongoing series. **In panel 3, right by Janine is Kenji from The Real Ghostbusters episode "Attack of the B-Movie Monsters"
***Like in the beginning of the episode, in this panel, he is reading his "Monsters" magazine. **In panel 4, the cylindrical building with the massive advertisements is the San-Ai Buidling. This confirms Kylie and Janine were sent to the Ginza ward of Tokyo, Japan. **In panel 4, on the far left building is Sony. ***The Yamani Studios signage from The Real Ghostbusters episode "Attack of the B-Movie Monsters" is below the black billboard. ***The lower part of the green billboard has 'Ghostbusters' in katakana. ***Under the big billboard is a grab of the Ghostbusters fighting Kani at the beach shore in The Real Ghostbusters episode "Attack of the B-Movie Monsters"
**In panel 4, on the far right, on the red cap is Nori Ra from The Real Ghostbusters episode "Attack of the B-Movie Monsters"
**In panel 2, once again, on the right is the Jump Bug arcade from Ghostbusters II. **In panel 3, the animated Ray alludes to the Atlas statue Proteus possessed in The Real Ghostbusters episode "Janine Melnitz, Ghostbuster"
**In panel 2, Luis Delgado's 15 easter egg is on the incident sign. **In panel 3, the animated Peter alludes to Egon's triage line to Janine in The Real Ghostbusters episode "Janine Melnitz, Ghostbuster"
**In panel 2, once more in the box by the stairs is the blue book with the NOW Comics' Slimer! #1 cover on it. **From Greek mythology, Proteus' gift for prophecy comes into play. **Of the four glimpses into the Ghostbusters' future, one shows an entity in silhouette. He is a Sandman who will appear in the Annual 2015 in November. **The four glimpses of the Real Ghostbusters' futures are from episodes that canonically take place after "Janine Melnitz, Ghostbuster"
***The trio of ghosts armed with a Proton Pack in "Janine's Day Off"
***Samhain and his fortress in "Halloween II 1/2"
**In panel 1, on the shelf right of Winston is Robobot from the Extreme Ghostbusters episode "The Infernal Machine"
**In panel 2, on the foot locker once again is the Real Ghostbusters Power Cycle. It was last seen in Issue #1. **In panel 2, another 15 easter egg appears on the grab of the Containment Unit Monitor. ***By ghosts. In Volume 1 Issue #16 of the ongoing series, Winston was trapped by the ghost of Staff Sergeant Adams. ***By men. This could be a reference to Winston's military career or in the first movie when he was arrested along with the other Ghostbusters. **In panel 4, another grab of the Containment Unit Monitor appears on the console. **Once again, just like in Volume 2 Issue #19 of the ongoing series, a god forces Winston to make a hard choice in the Firehouse basement. At least this time, it doesn't involve him dying. **As a nod to animation errors on The Real Ghostbusters, the guys put their Electric Gloves back on in panel 2 but in the next panel they are gone again. **The page adapts from The Real Ghostbusters episode "Janine Melnitz, Ghostbuster" when the Ghostbusters see Janine and Slimer in the boardroom, Janine references Lewis Carroll and Ray warns her Proteus is a primal god like Gozer. ** The page adapts from The Real Ghostbusters episode "Janine Melnitz, Ghostbuster" when Janine admits Proteus in his true form isn't bad looking to when she prepares to shoot the mirror the guys are trapped in. ** The page adapts from The Real Ghostbusters episode "Janine Melnitz, Ghostbuster" when Janine is about to fire on the mirror to when Proteus' energy beam bounces around the room. **The page adapts from The Real Ghostbusters episode "Janine Melnitz, Ghostbuster" when Egon advises everyone to vacate the Eerie up to when the Eerie blows up. **In panel 1, on the big sign left of the Firehouse references the Blody drink from The Real Ghostbusters episode "The Halloween Door" and recently is prevalent in the ongoing series. 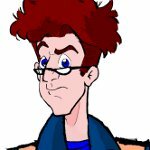 **The page adapts from The Real Ghostbusters episode "Janine Melnitz, Ghostbuster" when everyone gathers in the Firehouse, Egon thanks Janine, and Ray muses everything is back to normal. **The park scene is visually based on Battery Park in The Real Ghostbusters episode "Scaring of the Green" when the Bog Hound appears behind two men on a park bench. One of the men even appears. **As in Issue #1, the blue bird is visually based on the one that appeared at the start of The Real Ghostbusters episode "Mrs. Roger's Neighborhood" and is scared off by the stone lions. **The female Japanese ghosts appears to be based on a Yurei.